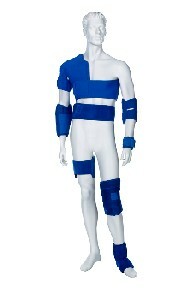 The first and only refreezable 8 piece athletic trainers kit. Covers everything - Shoulder, Elbow, Back, Knee, Ankle, Wrist, Universal cooler. Soothing cold & support in a single product Molds around body parts, follows body contours to allow deep penetration of cold to injured, inflamed or swollen tissue. Immediate application of cold therapy. Wear against your skin or outside clothing for comfort and results -- and clothing will stay dry. No more messy ice! One size fits most. Available in adult and youth size. Choose from left/right and red/blue. Recognized by professionals and customers as simply the best application of cold therapy. There is NOTHING like a ColdOne! The new ColdOne was reviewed recently by Swimmers Guide; strong marks for ColdOne shoulder wraps being used to provide cold therapy for "SWIMMER'S SHOULDER". Quote "It passed by tests with a gold medal performance." Matt Luebbers, Swimmers Guide. Home on Left Panel...scroll down to.....ARTICLES & RESOURCES...then to INJURY RECOVERY and DRUGS.....then to COLDONE REFREEZABLE INJURY THERAPY SYSTEM.